Sunflower implemented the Leadership Program in 2004, using the 21st Century Leadership model developed by the Kansas Health Foundation. 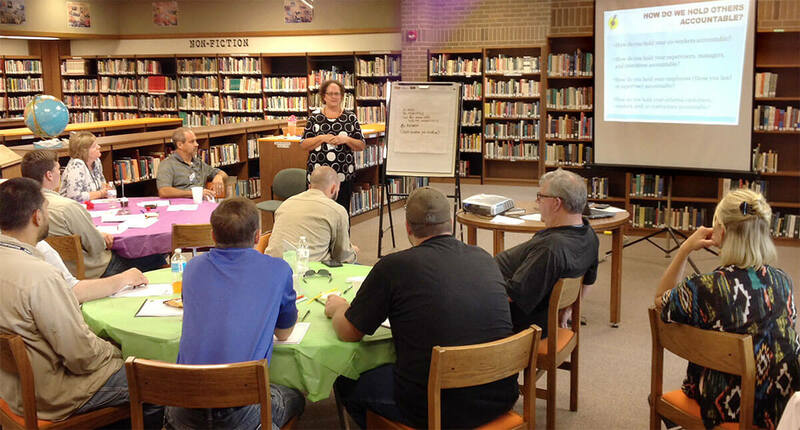 During new employee leadership, the purpose and goal of Sunflower’s culture statement are discussed. The expectation is for all employees to exhibit the core values: Technical Competency, Respect and Dignity, Accountability, Integrity, Trustworthiness and Servant Leadership. When we combine all employees’ strengths and talents, we have a more efficient, effective organization. Professional development is important to each of us as individuals and to Sunflower to continue to be a successful organization. It is good for morale and essential to a positive company culture and environment. People want to join and stay with an organization that offers development opportunities. It encourages people to take on responsibility and grow through achievements and experiences. We work with individual employees for development, offer training for supervisors and managers and provide individual and team coaching. As the organization responds to industry changes, leadership development and succession planning continue to be important. To ensure that training and development is successful, we provide tools and resources for training modules and utilize adult learning principles, including hands on experience, while addressing individual learning styles. In 2004, Sunflower implemented a company-wide leadership program based on the 21st Century Leadership model developed by the Kansas Health Foundation. As part of Sunflower’s leadership program, new employees learn about the company’s mission and culture, which promotes technical competency, respect and dignity, accountability, integrity, trustworthiness, and servant leadership. Ongoing company-wide leadership training, which occurs annually, ensures that behaviors reflective of Sunflower’s core values continue. As Sunflower responds to industry challenges and changes, leadership development continue to be important. That is why the company offers training for supervisors and managers, provides individual and team coaching, and offers education opportunities to its employees. These programs give confidence to employees to take on new responsibilities. Employee’s profession growth and leadership, fostered by Sunflower’s core values, extend beyond employees’ personal accomplishments and career advancement. Employees’ technical competency and accountability strengthen a company’s ability to adapt and grow. Personal values, such as respect, dignity, integrity, and trustworthiness, contribute to the company’s meeting the needs of its members.